Dylan Thomas was a poet but also much more., he was also a play writer and wrote film scripts. He is probably best known for his poem, ‘Under Milk Wood’. What I know about him is that a certain Robert Zimmerman changed his name to Bob Dylan out of his respect of the Welsh writer. 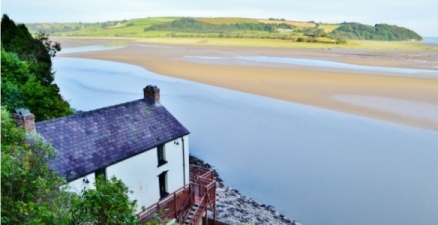 Thomas moved to Laugharne after he married in 1937 where he settled with his wife and family. Things were tough as writing was not bringing in any money. It was the BBC that raised his profile broadcasting his radio recordings in the 1940’s. This led to successful tours of America in the 1950’s. However on his fourth trip Thomas became acutely ill dying on November 9th 1953. His body was returned to Laugharne and he was laid to rest in the churchyard on 25 November 1953.